So without further ado, presenting a nostalgic chocolate bunny-eared look back! 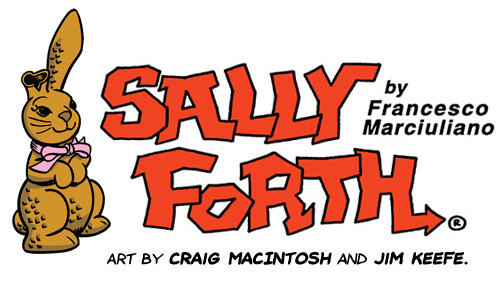 Side Note and Further Ado: Sally Forth first premiered in 1982 written and drawn by Greg Howard. The bunny ear storyline retrospective shown here only goes back to 1999 due to the digital files that were available. For those keeping track: The writing credit switch from Greg Howard to Francesco Marciuliano can be found on the top of the strip in the credit line. For art credit: The strips start off in 1999 with Craig Macintosh handling the drawing chores, then in 2011 Craig hired Jim Keefe to assist with inking and coloring the Sunday pages. The March 31, 2013 Sunday page was where Jim was in charge of the whole package – pencils, inks, lettering and coloring. Update: Here’s a link to the Sunday Comics Department blog’s spotlight on chocolate bunny ears past, Greg Howard edition! A yearlong subscription to all of King Features’ comics (new and vintage) plus ten years worth of archives for every single strip is a pittance at $19.99 a year! Sad to think the tradition is coming to an end. Is there a link to where the print copy can be purchased? Is there any place the older ones can be found? Older ones can be found at Sunday Comics Debt – Chew Your Ears Off. I’m not sure exactly how Comics Kingdom works as far as ordering prints. There’s a frame icon that if you click on it you can request one, but as the site was recently revamped, I’m unsure of the process. If I can find out more I’ll send the info along! Thank you so much for putting all of these together. Hilary is going to be in therapy for decades and will be able to trace the start of her problems back to her inability to ever taste chocolate rabbit ears on Easter. Thanks again.